The junior manager Front Desk is an important post who is a member of administration team. Rahman’s Chambers Banani main office is the first point of contact for respected clients and potential clients. Accordingly the chamber maintains qualified front desk manager for attending all local and overseas calls and queries. Front desk manager is also responsible for day to day administration within the Banani main branch. He/she also assist over Clint communication matters. 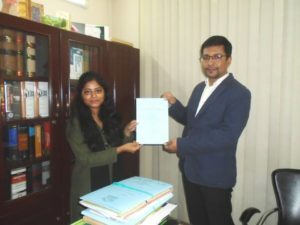 Ms. Rabeya Ferdous completed BBA( Hons) in Economics from reputed East West University in 2014. She joined the firm in 2016 as junior manager Front Desk and ever since her joining the firm immensely benefited from her communication skills with clients. Besides, she is in charge of day to day management of our Banani main Branch.